Tetraodon suvattii. Rolf Bandsma photo. I'm still playing around with different ideas of how to eventually house my violet dragon goby. Currently it is alone in a 55 gallon brackish tank, SG 1.005 (varies a little with water changes). I was thinking about an enormous tank, but I'm concerned with the ongoing cost of marine salt - especially considering 10-20% weekly water changes. So now I'm thinking about a much smaller tank. 55 gallons - 48" long is the minimum size for the goby. I read that dwarf fuzzy lionfish can handle an SG of 1.015 and up. My goby should be fine with that, too. I can even add a protein skimmer. <While these lionfish (and other, Pterois spp.) do occur in below normal marine salinities, I'm not convinced they inhabit such waters indefinitely. So I'm thinking about a 55 gallon tank with the goby and some dwarf fuzzy lionfish. I'd love some little blue leg hermit crabs, too, but I'm betting the lions would eat them, right? Would a 55 gallon be sufficient space for my goby plus 3 or more of the little lions? And would live rock work at that low SG? And would the rough surface of the rocks be a danger to the goby? <Live rock will in theory work, in the sense that once the bacteria colonise the anaerobic crevices, you'll get denitrification alongside nitrification on the aerobic parts of the rock. But the marine invertebrates and algae? Nope, they'll die at reduced salinities, except in a few cases which often end up as little more than green-brown algal slimes. Might as well just get Tufa rock, lava rock or "dead" live rock. Bacteria will colonise these just as well. Will they scratch the gobies? Maybe I should go full strength sea water so I can try corals or something, too. Would the goby be happy & healthy long term at the higher salinity? My goby isn't an aggressive feeder - it let Sailfin mollies & guppies munch the food intended for it. That's why it is alone now. Would the lions cause the same problem? Thank you for all the help with my questions! "Dwarf Fuzzy is certainly easier to get, so I will let BobF chime in here before I get too adamant about its suitability or otherwise!" Oh, and let me add Meghan, that you have another crepuscular predator option in the US trade; namely Butis butis, and beautiful species despite its “Crazyfish” moniker. Eminently suitable for life alongside Gobioides and *adult* Sailfin Mollies; will view bite-sized companions as prey. Please see attached for a photo of this underrated gem, a true brackish water specialist adaptable to anything from hard freshwater to full marine, but probably best in middling salinities. Adult length to 15 cm/6 inches; hardy, territorial but otherwise peaceful. Bottom line, unnecessary to maintain (and possibly stress) a marine predator at suboptimal salinities when there’s a good range of brackish water predators out there to choose from! I have an aquarium (30" x 25" x 18" -- footprint size 30 x 18) that holds about 58 gallons. I'm starting to research possible inhabitants. Is there a brackish frogfish that would be appropriate for it? All I'm finding are in the realm of 12" except a few around 9" that appear to be fully marine?? <As far as I'm aware, all Antennariids are marine, none brackish long term. <<Hello Meghan. There *is* a brackish water Antennariidae, specifically Antennarius biocellatus, though it isn't widely traded. Fishbase describes an adult length of 14 cm, or about 6 inches in old money. On the other hand, there are several brackish water Waspfish, Toadfish and other stealth predators that are traded and might fit the bill nicely. Neovespicula depressifrons, a very active grouper-like Waspfish; Notesthes robusta, a relatively inactive stonefish-like predator; Batrachomoeus trispinosus, one of several brackish water frogfish imported periodically. 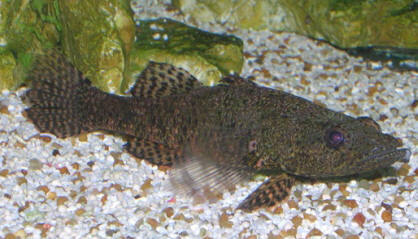 and a Pleco ( I know the Pleco gets too big, I'm putting it in a bigger tank when it grows). <Brackish water fish; will not live long in freshwater. By the way, I don't care what the guy in pet store says about them being freshwater fish. They're not. Sadly, decades ago this species got mixed up with another species (that looks nothing like it, called Tetraodon palembangensis). Since that time a few books said the Figure 8 was a freshwater fish, but everybody now knows it isn't, except people trying to sell this fish. in there with 2 Corys as well? Also if I put the figure 8 in freshwater until December would that be okay. And yeah my cousin has a 100 gallon tank so I'm giving him the Pleco when it gets bigger, and I'll buy another small one and continue that process. Now i could probably just make it brackish if all u need is salt. I ended up with a 6 gallon brackish tank with a figure 8 puffer. I love it. Thanks for all the help. and 1 zebra snail. About two months ago I noticed a baby zebra snail in the tank. I have watched it grow and it does a great job helping to clean the tank. Then today I noticed another baby zebra Nerite. It is much smaller than the first baby snail, so I am assuming it is from a different birthing. I have seen no evidence of the little white eggs anywhere. I am not sure if the fish are eating them or what. How can the single zebra Nerite be reproducing on its own? I thought it needed a male counterpart. I am concerned about the brackish water as well. I have done some research, but there are many opinions when it comes to aquarium upkeep. I have been talking to my local pet store employees. They are the ones that suggested the fish that I have now. I use one tablespoon of aquarium salt for every five gallons of water. <Which isn't brackish water. It's freshwater. You could drink that. Probably more sodium chloride in canned beverages. How to explain? Bear in mind marine conditions, true seawater, is 35 grams of salt per litre (it's easier to use Metric system for this). Brackish water is, let's say, 20% of that. So 5-6 grams per litre. That'd get you a specific gravity of 1.005 or thereabouts. Now, 5-6 grams is about 1 level teaspoon of salt. Bear in mind there are about 4 litres in 1 US gallon, so that's about 4 level teaspoons (or 1.33 tablespoons) of salt per US gallon. Scale that up for 5 gallons, and we're talking 4 x 5 = 20 teaspoons (or about 6.67 tablespoons) salt per 5 US gallons. In short, you're adding the equivalent of one-twentieth the amount of salt needed for even only moderately brackish conditions. What you're adding isn't even enough to treat Whitespot, which is about 2 gram/litre, approximately 1 teaspoon per 3 litres. See the situation here? I do a 20% water change every other week. I have a thermometer and heater that keep the water between 74 and 80 degrees Fahrenheit. Is adding aquarium salt the same thing as making brackish water? <Not really. In the short term yes, it will do some good and no harm. That sound like a stupid question, but I am not sure the parts per million of sodium chloride required to make my tank brackish. <That's the nub of the problem. Brackish water is made with marine aquarium salt, which is only partially sodium chloride -- it's lots of other chemicals too, such as calcium carbonate, that raise and buffer the pH. As for the snails, I will photograph the smallest one when I see it again. It is the same color as the gravel (light brown/tan), so it is very hard to see. The older baby snail was the same color, but its shell is turning black and it hangs out on the glass all the time now. It looks identical on the underside as the adult zebra snail. I have bought no new plants, so I cannot solve the mystery of the new snails. Thank you for your help. Greetings! I have been doing research on brackish tanks, mainly mangroves. WWM has been very helpful to me in the past and I'm hoping for some advice. and a Lesser Spiny Eel (7" with an awesome personality I might add). Everyone is still quite young and small, so id like some neat tank mates. Black Skirt Tetras (very old and large for tetras, ~3"), a mid sized CAE (5"), a small school of "African Leaf Fish" ( as named by PetSmart, not sure if they are true leaf fish, or leopards. 1.5"), an African Knife, and a Ghost Knife (both around 5"). So far my understanding is, the cichlids are possible, and the leaf fish are a maybe depending on species. If you feel none or few of these are good fits, what's a fish I could pick up that would go well? Also anything like a brackish Pleco or algae eater? I do know that common Plecos hate salt. Thanks in advance for your help. You guys have the best site, great info and fast responses so far every time. Certainly my go-to website for aquaria. I would like to get a Dragon goby and a flounder . I have a 30 gallon aquarium with a Madagascar Rainbowfish and an albino bristle nose Pleco (2"). I previously had 2 flounder and an dragon goby they are now both deceased. I found out the problem A no salt B I had large gravel. Now I have sand instead and I will add salt but I would like to know how much is necessary and will it harm my current fish? Also will I have to relocate my old fish first? so I might set up a brackish tank but anyway I would like to know what "oddball" fish would suit my aquarium ( preferably no guppies, mollies, tetras etc ). .P.S I live in the U.S MD and found the flounder, Brachirus pan, at a small exotic fish store called Ricks. I appreciate your forum. I'm new to the hobby, and have read a lot prior to starting, but now have some questions as I begin to populate my tank. I would like to have 3 compatible species. some medium sized plants: 2 java fern on rocks, 2 Anubias on rocks, 1 crypticorn I think, 1 anarchis stuck on a rock that actually has roots and new growth, and a large mass of soft hornwort floating. I also have an air stone- column style. I can add more plants if needed. I am debating heavily which fish to chose. I started the tank on 12-19, then while trying to decide on occupants and talking to the LFS, she told me that I need to cycle first if considering blue eyes or Bumble Bee Gobies which I was, and to put to 3 mollies and wait 3 weeks. I put 1 Molly in on 12-24, because I thought I didn't want to return 3, and I might later keep it in it's own tank. But it did nothing to the water, of course and became timid too, not happy without a group! Soon I really liked this tiny black balloon Molly and so I bought 2 more Mollies as instructed on 12-31. I had at that time added 1 tbsp of aquarium salt per 5 gallons. My starting test on 12-24 had indicated a hardness of 8.2!!! I live in Texas. However as I added the hornwort at that time, maybe that and the other plants helped get it to the current level of 7.6 tested 12-31. They told me that the limestone will actually buffer and stabilize PH and plants help to bring it a little lower. I really like the Mollies, they're colorful and much more interesting than some of the other schooling fish that need acidic or neutral anyway, so I decided why not go this easier route since they like my water. I am up to six little guys now (they're immature- sized 1 to 2 inches). There are two balloon males and 2 balloon females and 2 regular females, is this a good ratio? These varieties grow to 3 inches. I'm wondering whom to enlist as companions. I don't want to breed Mollies. I'd like 3 species, but I don't want to go over limit. I read that neon rainbows might eat fry. They're beautiful, but I worry my water is so hard (currently 7.6). Are there any small rainbow that would serve this purpose and like my setup? I like fork tail blue eyes but don't know if they eat fry, or would have issues with the Mollies. I heard that Orange Chromide are nice, peaceful, pretty. The LFS said she's had them successful in FW or Brackish--- I could go with FW version. Would I need 2 or could one work to control soooo many potential fry? Are the Orange Chromide females as colorful as the males? Would they be irritable if there were 2 or 3 females and no male? A source said that they become more aggressive when they breed so I don't want a pair. Freshwater Bumblebee Gobies, interesting and cute, are supposedly compatible, but the issue is-- will the Mollies gobble their food? These little Mollies like sleeping and scavenging on the bottom. I do need something to eat Molly fry, and not sure BBG's would do that. They sound like there are issues with it being difficult to get them to eat. Is this true? Knight Gobies are very cute. But would one terrorize my timid school of Mollies? A knight Goby and an Orange Chromide could finish off my school attractively IF the Goby weren't a terror. In one of your articles you said Indian Glass Fish are disease prone in hard water. Is my water too hard, and would my dose of 1 tbsp aquarium salt per 5 gallons be bad for them? I really kind of like the idea of 2 Glass Fish and one Orange Chromide, and I suppose if the Glass Fish fry usually don't survive to overpopulate I could do a pair. I heard Chromides don't mind schooling with other fish. But would the glass fish be sickly in 7.6 water with 1 tbsp per 5 gallons ratio of aquarium salt added? I would appreciate some input. The goal is- three species, but with the size of fish I have, not sure that is feasible. Unless there is some cute small little fish that can gobble up the fry. I had read that Rosy Barbs eat fry, and don't nip, but I just don't know if they'd like the small addition of salt that I keep for the Mollies. That is also the question with the Glassfish too.... hardness and small addition of therapeutic salt to keep Mollies a little less at risk for disease but not enough to kill my plants. Hi, my name is Sandra. First of all, merry Christmas :) and thank you for all your help. I have purchased 3 Gymnothorax tile (between 12 and 16 inches) for my husband as a Christmas present. They are in a tank with a violet goby (Gobioides broussonetti, sorry for bad spelling, at 10 inches). We also have a figure 8 puffer in his own tank. I was curious if we could keep all of these critters together? All are in brackish to marine conditions and yes, we purchased all to get them out of freshwater and bad conditions. My other question is what foods are safe for the eels? We have two eating frozen Silversides and krill. Once a week they get feeder crayfish. The mollies that were originally in the tank quickly became food except for one (her name is Lucky!) What else can we add to their diet to make sure they're getting the proper nutrition? Thank you again for your time and quick responses to previous questions. possibly the plants to adapt to brackish at all. So if I gradually upped the SG to 1.003, would a violet/dragon goby be able to cohabitate if the Jack was willing? It would definitely be an odd pair. May experiment at some point haha. you again for your time. A couple months ago on a trip to Nag's Head, NC I was stung in the hand by a stingray in the hand. After 4 or 5 very painful hours in the hospital I found myself fascinated by them. I searched and searched for the culprit that stung me on the internet and as far as I could tell it was a common Atlantic stingray (brown, about 12-15in across and two rows of spines down its back). Anyways I am starting a 55 gal brackish aquarium and would love to have a small enough stingray for the tank and hopefully look something like the one that got me. Is this possible? What species would be a match? <Unfortunately, there aren't any stingrays this small; at least, none that are traded. I don strongly suggest you get hold of a copy of Richard Ross' "Freshwater Stingrays" book or else "Freshwater Stingrays" by Hans Gonella. <Do perhaps look at the various Flatfish on sale. I have a 55 gal brackish water tank set up at a very low salinity of about 1.002. Temp is around 77 degrees. PH around 8. I also want to get a small school of about 6 Indian Glassfish. Eventually I want to get rid of the Platies all together and just keep a few Mollies (I have about 30 Mollies right now - woof). I'm wondering about additional tank mates. I've been reading up a bit on Brackish water tank mates for my fish and I wanted your opinion on a few. One type I've been looking at is a Mono (Finger Fish) I'm wondering if I could keep just one with what I have now? Or do they need to be in a group? Also how about a Fan Dancer Goby (Knight Goby)? Good tank mate for my fish? And lastly Archer Fish. I've read they're picky eaters? Could I feed it mostly flake food along with some live food. And if I were to feed it insects what kind of insects could I feed it? I'm in need of some advice about what tank mates are most suitable for a Stingray. I'm going to get a custom made tank (3' wide 2' tall 4' long) I hope this will be big enough! If I do fw I'm looking to put in 5 Silver dollars, 1 Fire Eel and a Stingray. If I do bw I'm looking to put in a Stingray and a Monoray Eel, please advise me if this will be ok, if not can you please give me a list of fw and bw that will be compatible with my Stingrays. Keeping Batfishes in Captivity 12/2/04 <Pufferpunk again> It's on WetWebMedia in the brackish section <I don't see it there. What I do read about the more commonly available species is this: "proves almost impossible to keep alive, generally refusing all food. This species is secretive in the wild, found hiding in wrecks and other dark spots, and should be left there. In my estimation, less than one hundredth of pinnatus bats live more than a month in captivity." & on spadefish: "Spadefishes can be summarily ignored by aquarists on a handful of damning characteristics. 1) They're very skittish in captivity; nervousness showing in difficulty in adjusting to small volumes, poor eating, "mysterious" deaths. 2) They're really only happy in groups... and 3) They get pretty darned big, some more than two feet long, and at least that tall." In addition to their being marine fishes.> -is there any marine fish that can be kept in brackish water? <Many marine fish visit BW occasionally, but are not to be kept there long-term, by any means. Even most BW fish wind up needing SW as adults. Please research the fish you choose carefully. ~PP. Re: Creating a Brackish Tank . . . I'm converting my 55 gallon tank into a brackish tank. I've bought a floating hydrometer, and a bag of instant ocean. I'm planning on the substrate being a mixture of silicate sand and the small gravel I originally had in the tank with a small amount of live sand placed on top. probably going to add live rock and plants as well. <I would not use silicates as substrate here. Please read through the various articles and FAQs files on brackish system set-up posted here: http://www.wetwebmedia.com/BrackishSubWebIndex/BrackishSubWebIndex.htm> Thought this site was where I had seen silicate sand recommended, but apparently not. The site that recommended it said it would catch pockets of gasses under it that would be useful to plants, thus my plan to use it. Silicate sand is out, gotcha. Most of the brackish info I've gotten was here. Great site! <I would not use silicate based sand for a few reasons (stated on the marine substrate article, FAQs)> I basically got into aquariums three years ago when I saw a display of oddball and eel fish at Wal-Mart and I had gotten away from that kind of fish, but they've always been my favorite. Since most of these fish are really brackish I'm going to try to do it right this time. I'm considering a freshwater moray, a couple of rope fish, and a dragon fish (violet goby) with possibly a F lionfish or banjo catfish as well. I know I'll need to add them slowly. Will these fish do alright together? <Mmm, no. Please insert the common names of these fishes into fishbase.org and/or www.WetWebMedia.com search tool and read what their water chemistry ranges are...> I was planning on having a salt level of 1.005 and a PH of about 7.8. Does the setup sound O.K.? <No... the Ropefish, banjo cat live in acidic to neutral water...> I went to fishbase.org like you suggested and it says the whiptail banjo cat (which is the only one I'm sure is brackish) has a pH range: 6.8 - 8.2 which would fit fine with my plan. I should have specified the banjo I was referring to, but I've never heard of any other banjos referred to as brackish fish before. I posted this on one your boards and someone talked me out of the banjo anyway. <Good. This, these species are very slow, difficult to keep fed placed with more eager eaters.> Just taking up room at the bottom of the tank. http://www.fishbase.org/Summary/SpeciesSummary.cfm?genusname=Platystacus&speciesname=cotylephorus It says the Reedfish has a pH range: 6.0 - 8.0. http://www.fishbase.org/Summary/SpeciesSummary.cfm?genusname=Erpetoichthys&speciesname=calabaricus Not much info given on the FW lionfish (aka three-spined frogfish). It gives a minimum temp (same as others), but no pH range. http://www.fishbase.org/Summary/SpeciesSummary.cfm?genusname=Batrachomoeus&speciesname=trispinosus Again, nothing about pH on the violet goby (aka dragon fish), but good reading. http://www.fishbase.org/Summary/SpeciesSummary.cfm?genusname=Gobioides&speciesname=broussoneti Not much listed about the Moray Eel either. http://www.fishbase.org/Summary/SpeciesSummary.cfm?genusname=Gymnothorax&speciesname=tile I'm a little worried that there might be too many fish at the bottom of the tank though the rope fish and moray will explore the range of the tank at times. I really know nothing about the banjo cat or FW lionfish. I've read what your site has on the lionfish (toadfish), but couldn't find anything on the banjo at all. I've kept rope fish, dragon fish, and a moray before and have read everything I could find on the web about all three. I think all of these fish will at least be safe from each other and at least the three I'm familiar with will eat similar foods. Any help would be appreciated! Chris Jones <Study for now, ahead of purchasing your livestock. Bob Fenner> I've had Archerfish suggested to add some thing to the top of my aquarium and either Mollies or Guppies to supply fry. Would any of these do well to stop my tank from being so bottom heavy? <Yes... and many more possibilities for brackish livestock exist, are available. We list several on WetWebMedia.com and there are other brackish websites> Would they survive? They all fit the pH range and brackish requirements. <Archers, mollies, guppies? Yes. Bob Fenner> Thanks!